Plantain Moi Moi (Ukpo Ogede) is one of the Nigerian plantain recipes prepared with overripe platains. Do not let the look of this meal deceive you! It is very delicious. Yes, it has this unique taste that your taste buds will love. 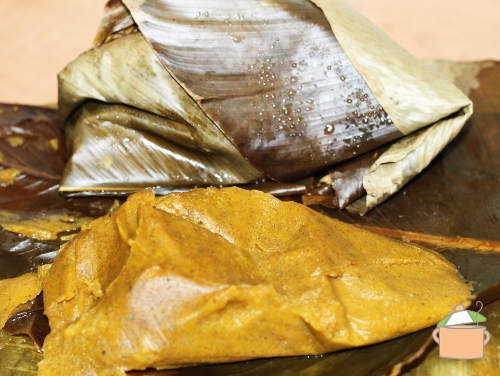 Prepare the uma leaves for the Plantain Moi Moi using the method detailed at: How to prepare uma leaves for Moi Moi. Put the plantain flour in a bowl, add a small quantity of water and mix till you get a medium consistency. Wash, peel and cut the overripe plantain into small pieces. Grind the crayfish, cut the onions and pepper into small pieces. Blend the overripe plantain pieces, plantain flour batter, onions, crayfish, pepper and stock cube with just enough water to allow the blades of the blender move. Pour the smooth blend into a sizeable bowl. Add salt and palm oil. Mix thoroughly till well combined. Set a small quantity of water in a pot to boil. When the water boils, place a base for the Plantain Moi Moi wraps into the pot. This can be scrap pieces of aluminium foil, a stainless steel stand or leaf stalks from the uma leaves. Scoop the mix into folded uma leaves, just as you would with beans Moi Moi. Gently place the wraps in the pot of boiling water and cook for 20-25 minutes. Add water along the way if necessary. Leave to cool down completely and set before serving. Serve with Custard, oat meal or akamu (corn starch meal). It can also be eaten as a snack with a chilled drink.